Kitchen! Kitchen! : saucer size portabella mushroom......at kitchen! kitchen! saucer size portabella mushroom......at kitchen! kitchen! soup! Your inner goddess will love you more! Italian basil/or lemon basil basil - just tear up the leaves and sprinkle on top. 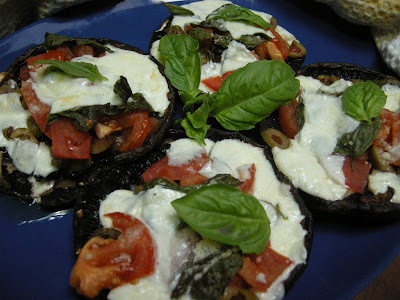 Combine parmessan cheese with chunks of mozzarella (shredded will do too);and sprinkle on top of each stuffed mushrooms; bake in preheated 350 F oven for about 10-15 minutes until the cheese starts to melt. Sprinkle some kosher salt while it is hot -drizzle with some olive oil and garnish with basil. simply jersey tomatoes......at kitchen! kitchen! home made hummus ....at kitchen! kitchen! just grill it!.......at kitchen! kitchen! Mutti's potato pancake.....at kitchen kitchen! have brunch with us!......at kitchen! kitchen! pan grilled steak.....at kitchen! kitchen! a minchi what?! !.....at kitchen! kitchen!